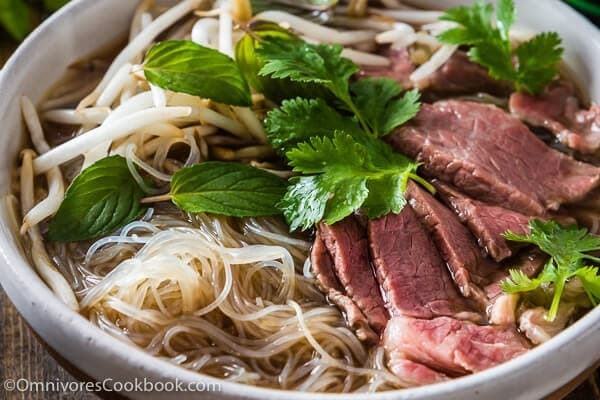 Today, I want to share 10 tips related to Asian cooking that will help you cook satisfying meals that contain fewer calories. Make whole foods taste more delicious so you won’t crave dessert after every meal. Make cooking easier and faster so you won’t mind cooking more at home (and stop buying frozen pizzas!). Consume slightly fewer daily calories than you used to, so you can lose weight naturally. This was one of my favorite dinners when I was living alone. Whenever I was feeling lazy, I’d just buy some mapo tofu sauce from the supermarket. All I had to do is to stir fry some ground chicken with a bit of oil, add the sauce, bring it to a boil, add tofu, and let cook a bit more until the tofu was cooked through. At the end of the cooking, I’d throw in a handful of green veggies to add a few more nutrients. This is a very delicious and low-calorie meal that you can finish in 15 minutes. The dish is really satisfying, even without rice. 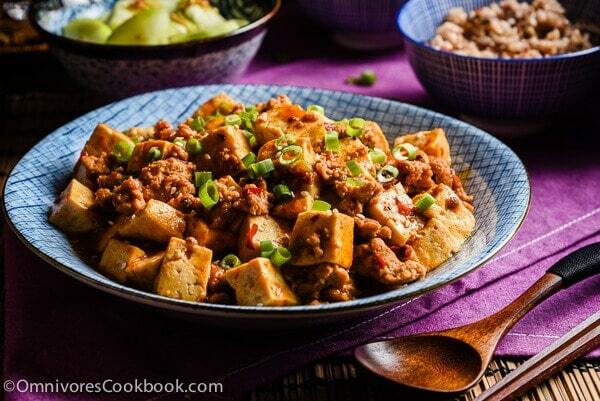 If you don’t mind spending 10 more minutes on this, you can use this mapo tofu recipe to make it 100% wholesome. The great thing about mapo tofu sauce is that it goes well with almost any veggie. Don’t want to eat tofu? Try potatoes, cauliflower, broccoli, mushrooms, and more. 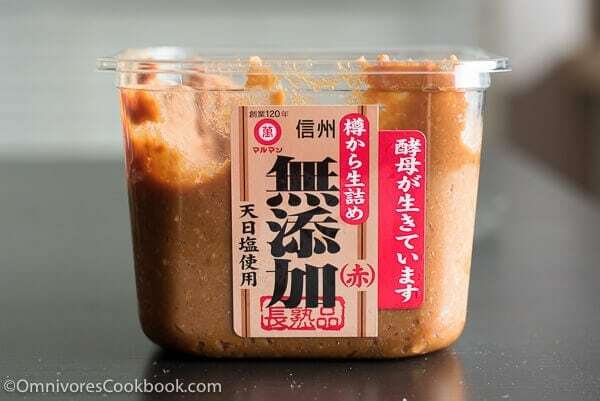 Miso paste is a magical ingredient that adds great flavor no matter what you’re cooking with. First of all, you can make miso soup. It’s the easiest way to add veggies and protein to your dinner. Almost everything tastes great in miso soup. If you add in a bit of Korean fish cake or seafood and a small amount of noodles, it will make a complete meal. Quick tip: if you don’t want to make dashi from scratch, use dashi powder to make the soup instantly tastier. You can also use miso paste to make your beef rice bowl irresistible. Serve it with brown rice or the magic noodles in tip #5 below, or stir in vegetables during cooking so you won’t need to serve it with carbs. Miso is great for baking veggies, too – like this gorgeous oven-roast eggplant dish. You can use this glaze on asparagus, bell peppers, carrots, onions, etc. It is a very delicious way to consume veggies in bulk. 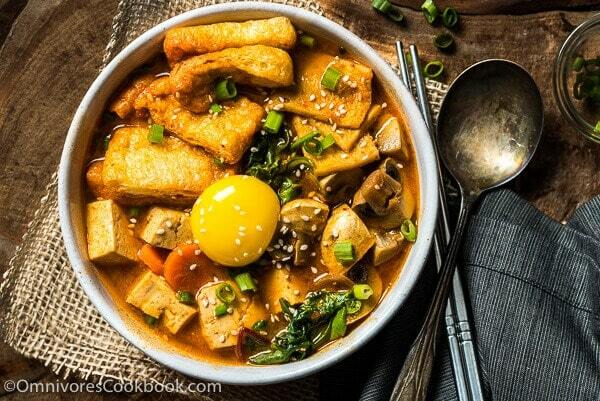 Korean stew was of my favorite lazy meals when I was living alone. And now, it’s become our family’s favorite comfort meal of all time. The great thing about the stew is that you can throw in whatever ingredients you like – meat, veggies, seafood, etc. – and they will all turn out damn delicious. Back in Japan, I wasn’t good at cooking and was sometimes too busy to cook. What I did was purchase some Korean broth, a few veggies, and some sliced meat (or shrimp) from my local market. All I had to do was bring the soup to a boil, dump in all the ingredients, and wait until they cooked through. Just like that, a nutrition-packed one-dish-meal can be be ready in 20 minutes. Even better, you’ll feel very satisfied after drinking the soup, so the total calorie consumption will be low. If you really like Korean stew and don’t mind spending ten extra minutes to cook, purchase some gochujang and doenjang, so you can assemble your own Korean stew at a lower cost. Fried rice is too delicious to abandon. So is kung pao chicken on top of rice. To make your meal of Chinese stir fried food healthier, replace white rice with brown rice. Not only does brown rice contain fewer calories. It also has a lower glycemic index, which means it keeps blood sugar levels steady and can even help your body metabolize fat more efficiently (according to BBC Good Food). This is a practice that most Chinese families do daily because it’s the smart thing to do. It’s fast, gets rid of veggies in bulk (i.e. gets you to eat a lot of them), and makes them taste great. Don’t worry about pairing Asian stir-frys with Western style food. They go well together most of the time. Stir fried bok choy with crispy tofu – you can also make this with a lot of other green veggies. The crispy tofu is gold. It tastes even better than meat. Zucchini stir-fry – the original one contains meat, which you can totally ignore, and the dish will be just as tasty. 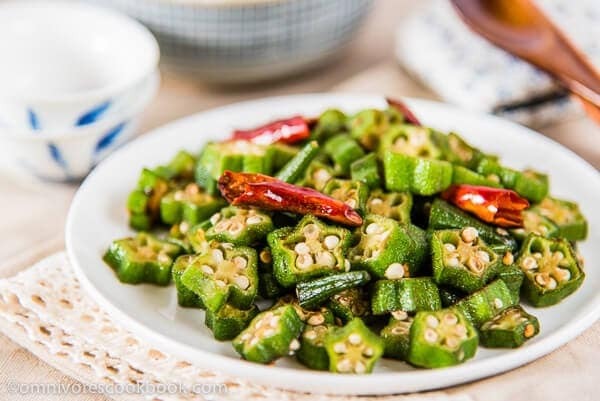 Four-ingredient okra stir fry – not only does it make the okra flavorful and less slimy, but the cooking method works on other greens, as well. Szechuan fried green-beans – the cooking takes a bit of time but is highly rewarding. You can apply the method to cauliflower, too. The zero calorie noodles go by a few names in the Asian market. You can find them labeled as: shirataki noodles, konnyaku noodles, or miracle noodles. It may sound like a new thing, but it’s actually a traditional food that Japanese people have been eating for over 1500 years. The noodles have a jelly-like texture close to that of thin rehydrated rice noodles. It’s made from the “Konnyaku potato” and either calcium hydroxide or oxide calcium extracted from eggshells, and consists mostly of dietary fiber. Thus, zero-calorie. You can learn a bit more about the noodles and how to prepare them in this article. Long story short, these things will make you feel like you’re eating noodles and getting full, but they contain no calories. So, next time you’re craving a bowl of dan dan noodles but want to watch your weight, you’ll know what to do! Can’t give up mayo based salad dressings? Try out a Japanese sesame dressing to create a super delicious salad with less mayo. 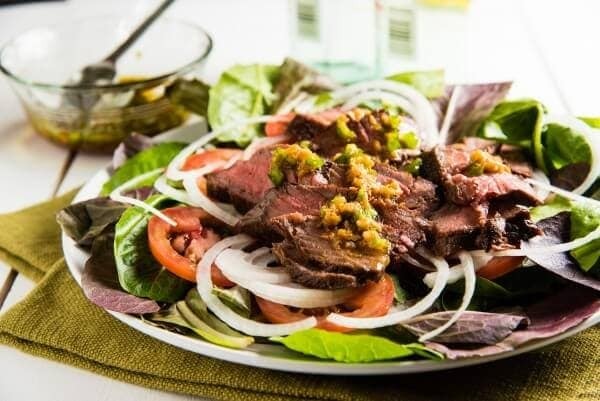 Or you can use a yogurt creamy based Asian dressing or a spicy soy sauce based dressing to make a very satisfying salad with grilled or poached meat. These salad dressings are very flavorful and contain fewer calories than the average oil-based salad dressing. 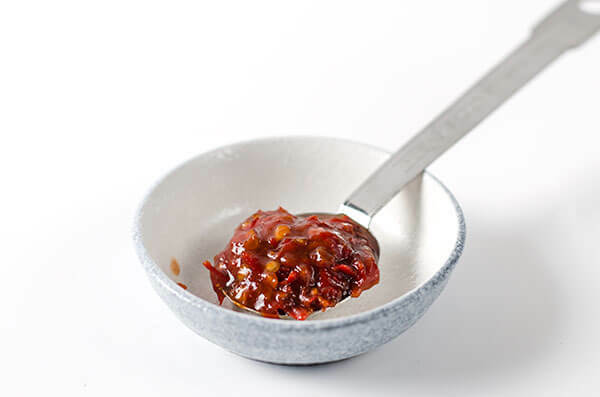 If you haven’t started using Doubanjiang (Chinese Spicy Fermented Bean Paste), you should make it your new friend this year. 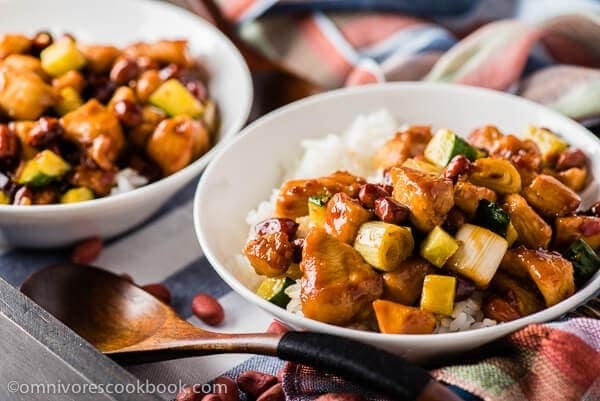 Not only will it help you make authentic Sichuan food, but it can also be used in a vegetable stew (you can skip the meat in this recipe) and for grilling. It makes prep very simple because the spicy paste itself is so fragrant and flavorful. Can’t have movie night without a big bowl of cheesy dip and a bag of tortillas chips? 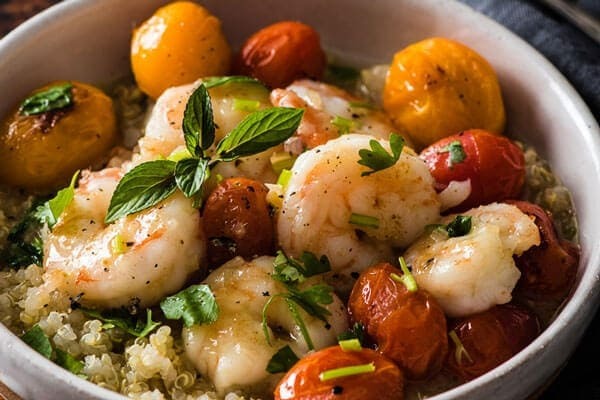 Try this green curry shrimp stew. I served it with quinoa when I shot the picture, but we often serve this curry as a chip dip. The coconut milk makes it very creamy and rich. We use it as a replacement for heavy queso or cheese dip. Loaded with goodies but with fewer calories. You don’t need to get rid of pizza or start eating ten apples a day to lose weight. Start by cooking your dishes with less oil. Believe me, it will make a difference without you noticing it. 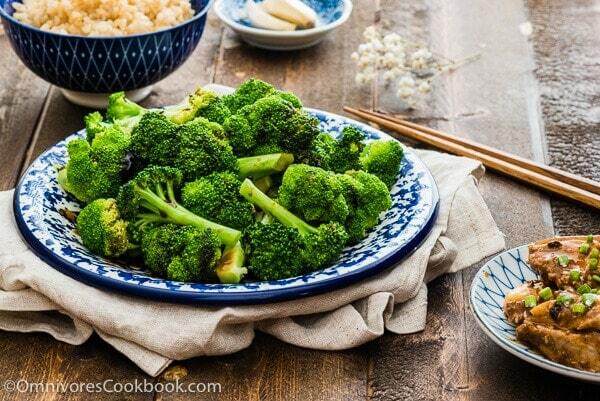 For example, instead of roasting broccoli in the oven or stir frying it on the stove, try steaming it. It doesn’t require oil, will retain more nutrition, and can be very delicious. Try out the simplest way to enjoy a plate of steamed veggies, and serve them Cantonese style. I want to order your cookbook but I am not on PayPal because my credit card info was hacked on it. Your site will not let me access the visa option what can I do to get one? I like that you talked about how you can easily substitute certain foods for other foods if you don’t like it. My brother is looking to find a good fast Chinese food restaurant he can do to during the week. I’ll be sure to talk to him about finding a restaurant that has lots of options. I just started cooking at age 73 and just love your recipes.